1. TPES are Recyclable – Our thermoplastic elastomers can be recycled to nearly 100% allowing them to be processed over and over again. The uncured molecular chains allow the TPE to be melted down repeatedly, minimizing scraps and waste in the manufacturing and molding processes. You save more material and take a step in helping to eliminate waste from the planet. 2. Easily Molded – TPEs are more easily processed and molded then other materials, that with their ability to be recycled make them ideal to be reprocessed and remolded. This is ideal for a variety of manufacturing methods including, injection molding, extrusion, co-extrusion, blow-molding, and thermoforming. 3. Variety of Properties and Characteristics – Thermoplastic elastomers can be formulated to meet a large range of market demands. From low specific gravity to a range of tensile strength, and even Shore OO to Shore D hardness ranges TPE really has something for everyone. This versatility offers excellent design flexibility as well, including varying degrees of clarity (including crystal clarity) and elasticity, colorability, processability, excellent UV resistance, excellent low-temperature properties, bondability to different substrates. 4. 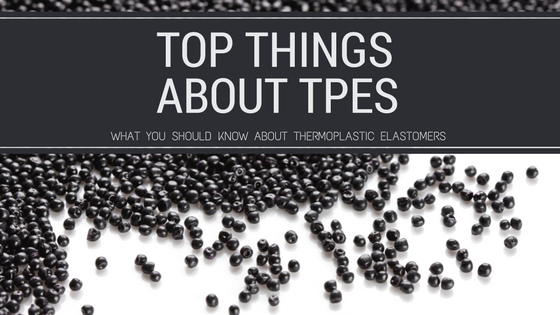 No Drying – Unlike thermoset rubbers, TPEs do not require any drying, curing, or vulcanization. This makes the processing stage of TPEs faster then other materials. For more information on TPEs check out some of our most popular posts. You can also call or email us at sales@starthermoplastics.com or (708) 343-1100.